The most important day to advocate for the Earth is not April 22nd, but April 23rd. Frustrated by such cynicism, some environmentalists have called for abolishing Earth Day. But that would be throwing the baby out with the polluted bathwater. Instead, why not recall the real history of Earth Day and revive its original—and much more demanding—vision? Little remembered today is the fact that even the first Earth Day itself, back in April 1970, occurred amidst vigorous internal debate among environmentalists as to whether it represented a genuinely promising burst of ecological consciousness or was merely a crafty diversion on the part of an establishment eager to redirect the energies of young activists away from the more pressing, more sensitive issues of race, poverty and the Vietnam War. 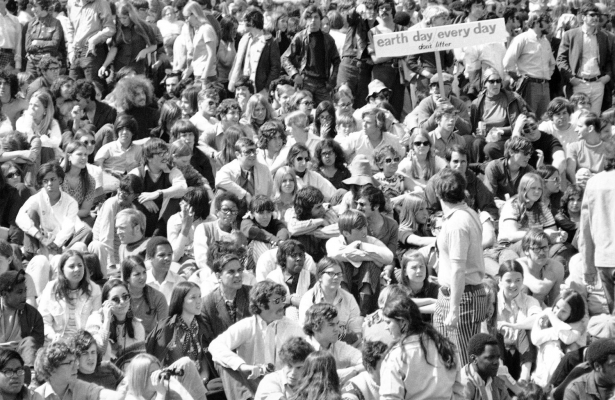 In an April 6, 1970 article in The Nation, the Chicago-based journalist Raymond R. Coffey examined how students and professors active at the University of Michigan’s “teach-in on the environment” that March—the precursor to the first official Earth Day the following month—were deeply conflicted about how quickly mainstream politicians acted to co-opt their event. Ecology has become a very important issue on campuses this season, and this teach-in was the forerunner—a kind of model—for thousands of college and high school colloquia to be held on April 22, dubbed “Earth Day” by the sponsors. The beleaguered environment is the kind of issue, some think, that might capture the idealistic spirit and the concern of young people as did the Peace Corps and Vietnam…. The attractiveness of environment as a political issue is fairly obvious. An uncompromising stand against dirty air and for clean water should win votes, and hardly hits the same mark on the controversy scale as does taking a strong position on Vietnam. Coffey then quoted several Michigan students who noted that it was precisely the issue’s attractiveness to politicians which ought to given environmental advocates pause. Barry Bluestone, a graduate student in economics and a veteran of political movements on the Michigan campus, told a reporter that he believes leaders in the political and industrial establishment are deliberately pushing the environment issue “to take some of the force out of the anti-war, anti-racism, anti-poverty issues.” And even [Douglas] Scott, the teach-in co-chairman who has been largely nonpolitical as a student, said many young people suspect their concerns are being diverted by the environment cause. In general the environmental organizations in this country and the official agencies that have grown up in response to them have not, over the past two decades, gotten beyond the most elemental Where-does-it-hurt? questions; certainly they have not raised the deeper, subsequent questions or demanded the still deeper answers. Earth Day 1990, I regret to say, for all its ballyhoo and good intentions, has moved not one step out of that mire…. It is an operation—however well meaning, however many good people involved—that is, at its core, a shuck. For after telling us where it hurts, it gives us only the most simplistic sorts of remedies. Its first is personal “life-style” Band-Aids for hemorrhaging wounds and do-it-yourself surgery; its second is the nostrum of federal laws and regulations, providing the patient with more of the kind of cures that created the disease. And it never gets around to asking—much less proposing answers for—those fundamental questions this society must be forced to face: Who, really, is causing the degradation and destruction of the environment? How can they be stopped, and stopped short, not just “regulated” and “overseen” and reformed? Why has society allowed this to go on, to the point that all oxygen-dependent species, including humans, are imperiled, and why do we seem powerless to prevent it? What would it take to accomplish the serious, wrenching, full-scale readjustments that in fact are necessary to save the earth, including reduced standards of living, consumption and growth; severe population reduction; and a new, modest, regardful relationship with the earth and its species? Who is going to carry this literally vital message to the American people? And when? For the time, as every new crisis lets us know, is later than we think. But importantly, Sale did not think Earth Day entirely without value, and his conclusions are as valid today, a quarter-century later, as they were in 1990. However, I do not despair of Earth Day entirely. I belong to three organizations that will be taking part in activities of one kind or another in New York City; I will be participating in a couple of forums and giving a talk during Earth Week; and I will get up early on Sunday to travel out to the middle of Pennsylvania to give another talk on Earth Day itself. It is obviously a time when at least some part of the population will wish to hear messages about the earth, and they need not all be shallow and individualistic. In short, we must make of Earth Day what we can. Many I know will take the opportunity to criticize it, in a friendly fashion, and to educate when and where they can. Many will regard it as an occasion to organize and recruit for one righteous cause or another. And many will treat it merely as day one of a campaign to carry on with the spirit of Earth Day (or their version of Earth Day) in a more concerted and farseeing way. Whether in 1970, 1990, or 2014, the most important day to advocate for the Earth is not April 22nd—it’s April 23rd.